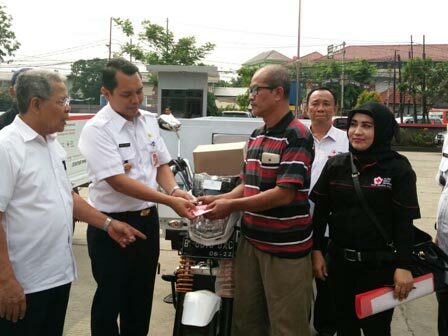 North Jakarta Mayor, Wahyu Trihadi handed over three motor carts aid for three waste banks in his area.
" Motor cart existence is really important to facilitate waste transportation from residents house to waste bank for sorting"
Those three waste banks are located at RW 01 and RW 02, Ancol Urban Village, Pademangan Sub-district. The other is located at RW 04, Penjaringan Urban Village, Penjaringan Sub-district. "Motor cart existence is really important to facilitate waste transportation from residents house to waste bank for sorting," he said after gave motor carts aid for three representatives of waste bank at North Jakarta PMI office yard, Jl. Plumpang Semper, Wednesday (7/12). He expressed that he really appreciated motor cart as an aid from North Jakarta Administrative and North Jakarta PMI collaboration. Hopefully, that aid could optimize waste bank's performance in his area.